1. Special ticket deals have been extended for performances through July 4th, meaning you can save up to 50% on orchestra, mezzanine, or loge seats with the online code 28West (note: loge seats also trigger a coveted "Kenny Loggins Pun Opportunity"). 2. On the get-out-of-trouble-free list, "remember that time I took you to WICKED?" is right behind "remember that time I saved you from that chupacabra?" 3. That Green Face will finally convince her she wears too much makeup. 4. This will prove to her that you have a heart and a brain. Announce your plans to your friends, and that'll take care of the courage part. 5. 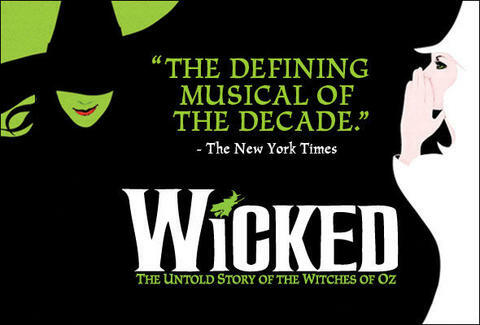 One showing of WICKED will get you out of 16 episodes of high school kids singing show tunes (except the ones with former WICKED star cameos -- you should definitely watch those). 6. If you've been wondering if your girlfriend is good or evil, this should give you some points of comparison. 7. If you do this for her, she's gonna do that crazy thing you always wanted her to do: take you to Medieval Times. 8. There are still several months before football season starts. What the heck else are you going to do? 9. It doesn't matter if you like musicals. It doesn't even matter if you like your girlfriend. Flying monkeys kick ***. 10. Special ticket deals have been extended through July 4th, meaning you can save up to 50% on orchestra, mezzanine, or loge seats with the online code 28West (+ chance to say "How are you enjoying your Kenny Loge-ins seats?"). So there you have it: a brilliant opportunity to make your special lady friend eternally grateful, for up to 50% off with the online code 28West. If you're in girlfriend trouble, consider this a highway right out of the danger zone. *Tickets subject to availability. Convenience fees apply. Offer available through internet at shnsf.com, ticketmaster.com and Ticketmaster Charge-By-Phone. Tickets may also be purchased with special offer code in person, without convenience fees, at the Orpheum Theatre Box Office (1192 Market at 8th, Mon 10am - 6pm; Tues - Sat 10am - 8:30pm, Sunday 11am - 6pm). NOT available at Ticketmaster Ticket Centers. Offer does not apply to previously purchased tickets. Restrictions may apply. No refunds, cancellations or exchanges.